‘The Liar’s Chair’ is Rebecca Whitney’s debut novel. It was published on the 15th January 2015 by Mantle. I was kindly sent a proof copy to review. This story is set in and around Brighton. Rachel and David appear to have a good solid marriage. They’ve got everything; a successful business, a big house, nice cars. What more could they possibly want? However, things are not as they seem. David likes to be in control of everything including his wife. Unknown to David, Rachel has been having a fling with someone else and drinking heavily. One Saturday morning on the way home and still under the influence of alcohol, Rachel hits a man with her car causing instant death. She doesn’t know what to do and is terrified so she confesses to David about what she has done. David destroys all evidence of the accident and insists that they carry on as normal. But Rachel finds it impossible to do that and can’t switch off at all leading to her behaviour becoming increasingly self-destructive, which doesn’t please David at all. Will Rachel be able to sort herself out? That’s for you to find out. 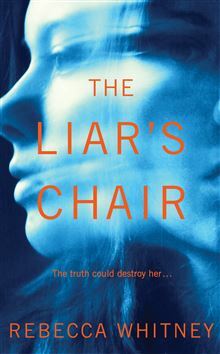 I was looking forward to reading ‘The Liar’s Chair’ as I like a good psychological thriller, especially one where the author has really got into her characters minds. I thought Rebecca Whitney did an excellent job of this with Rachel. I found that I couldn’t warm to any of the characters. None of them were particularly likeable. I did feel a little bit sorry for Rachel even though what she did was wrong. David was a nasty character and the way he treated Rachel was appalling. There are three parts to this book. I like the way the chapters have been set out, giving you a good insight into Rachel’s past which explains a few things. ‘The Liar’s Chair’ is a sombre, shocking and bold story. I added to my wishlist as it sounds my sort of thing. I noticed in other reviews a lot said the same as you-that the people featured were all pretty unlikeable which made me smile !! I thought the same in a book I read last year called The Dinner !